When a couple or a group of friends take a limousine out for the evening or a day trip, they often wonder how much they should tip their chauffeur. Some people may not even realize that they need to tip the driver and think that the gratuity is part of the amount they pay for the limo service. 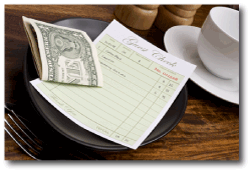 For the majority of limo service companies, the gratuity or tip is not included in the price of services. If a group of friends have hired a chauffeur driven limousine for the evening, say to bring them to and from a concert, and maybe dinner before hand and drinks afterwards, it might be a good idea for everyone to pool their money; just as they did for the ride, and tip the man or woman before the ride is over. This way they won't forget at the end of the night. When calling to check prices on a limousine service for a special evening, a concert, sporting event, wedding day, bachelorette or bachelor party or other occasion in which a limo ride would be appropriate, it is always good to figure in a 10 to 15 % gratuity after receiving the price. This should be included into ones budget so that there are no last minute rushes to find an ATM machine or trying to come up with the funds. If it's planned for, then it will make the evening easier and better, less stressful and nothing to worry about. If a chauffeur has done an exceptionally good job, for a wedding or a business customer, then an individual could tip them more than the customary 10 to 15 percent. They may have gotten your party to everything on the agenda on time, kept quiet, opened the doors and been very polite and then this would warrant the high range of the tipping scale or a higher tip. If a chauffeur was 'off their game', first, we would like to know, and then tipping them the low range of the scale would be appropriate. For those special evenings when a couple wants to be left alone to talk or simply enjoy a quite ride in the limo, there is a privacy partition. It is perfectly acceptable to ask the driver to engage the patrician so that a couple can have their privacy, that's what it's there for. A diver will not be offended or get upset. If someone might find this difficult to ask for, they could request that the privacy divider be deployed when the make their reservations for the limo ride. That way the diver will already know not to disturb you and your guest. There is a radio communication system from the back of the limousine to the front and the driver. This is put in place in case there is a change of plans and the couple or group wants to add a stop to their evening or needs to cut their night short for any reason.